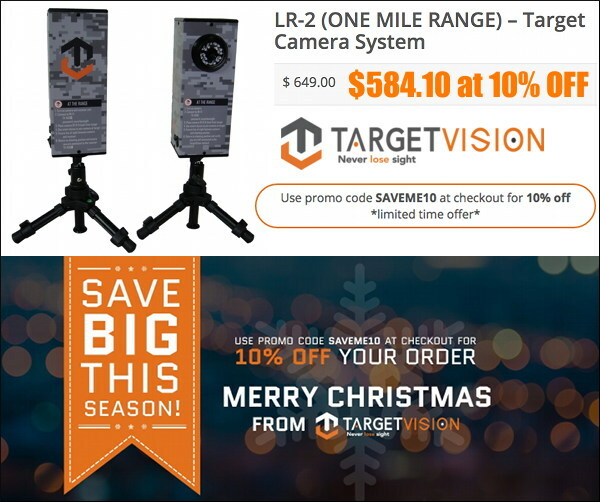 As a holiday promo, you can now save 10% on all TargetVision Camera systems. We think these are some of the most sophisticated wireless target imaging systems you can buy. The popular LR-2 TargetCam System, with 1 Mile (ideal) range, normally $649.00, is now $584.10 with Promo Code SAVEME10. Or, for ultra-long-distance shooting, get the ELR model with 2-Mile (ideal) range. With the 10% off Code, the ELR is $809.10, reduced from $899.00. We like the Target Vision systems — the hardware is top quality, plus the software is reliable and will display your shots on your favorite mobile device. NOTE: Some items are out-of-stock but these can be back-ordered. Act quickly — RCBS’s best rebate program of 2018 runs out at 11:59 pm on December 31st. 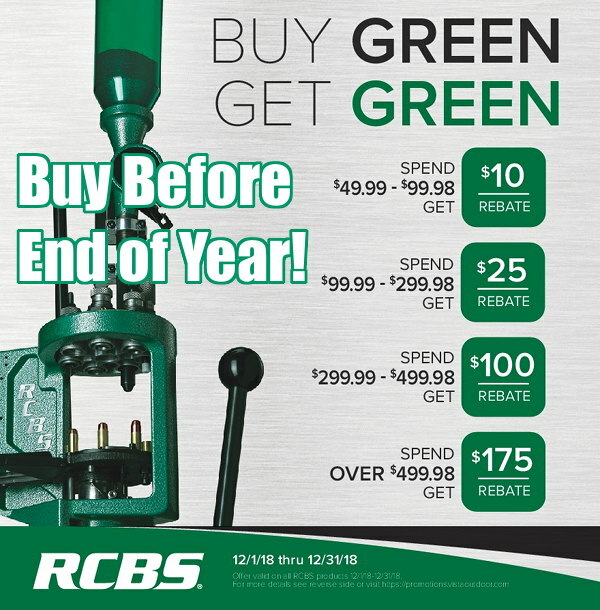 The Holiday 2018 Buy Green Get Green promo is simple — buy ANY RCBS product over $49.99 and you qualify. There’s no restricted list of “qualifying” products. The more you spend, the more you get back — up to $175.00 total. On a $300 purchase you can get a big $100.00 rebate. And on a $500 purchase you can get a whopping $175.00 rebate — that equates to HUGE 35% net cost reduction, lowering the $500.00 item to just $325.00. The $175.00 you save can get you a very nice digital scale/dispenser, 4-6 boxes of bullets, or some nice, new dies. Or just use the money saved for other household holiday expenses. If you are considering purchasing a single-stage press, electronic powder dispenser, progressive press, or a full reloading kit, save big with this promotion. It is good for purchases made through the end of the year, December 31, 2017. Submit RCBS Rebate Forms HERE. We love Whidden Gunworks’ Click-Adjustable Dies and die Lock Rings. The adjustability makes it easy to make precise changes in shoulder “bump”. 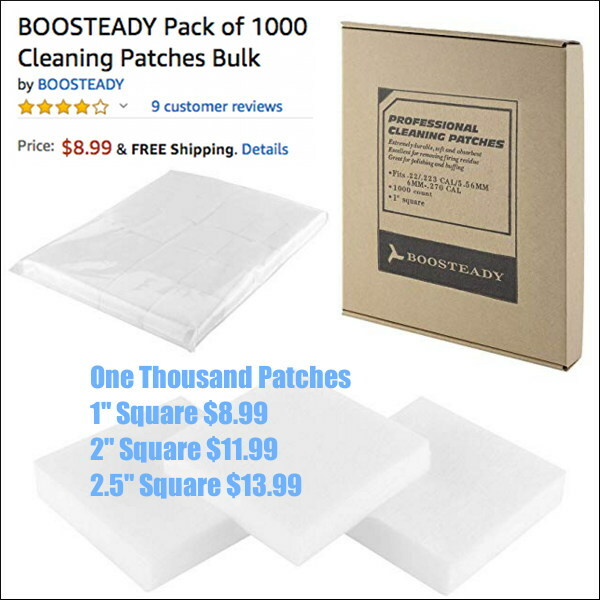 Each click provides true 1 thousandths adjustment and has .100’’ total available travel. Those loading for rifles with different headspace can easily optimize the “bump” for each rifle. And the new, patent-pending Universal Click-Adjustable Lock Ring can turn your current sizing die into a Click-Adjustable die. The ring works with any brand of 7/8 OD sizing die with standard thread pitch — e.g. Whidden, RCBS, Redding, Lee, and Forster. Now through the end of December 2018, you can save 10% on Whidden Click-Adjustable Sizing Dies and Click-Adjustable Lock Rings. Use CODE CLICKSALE to save 10%. Act soon — this sale ends at 11:59 pm EST on December 25, 2018. This is an incredible SALE, good through Christmas Day at 11:59 pm. 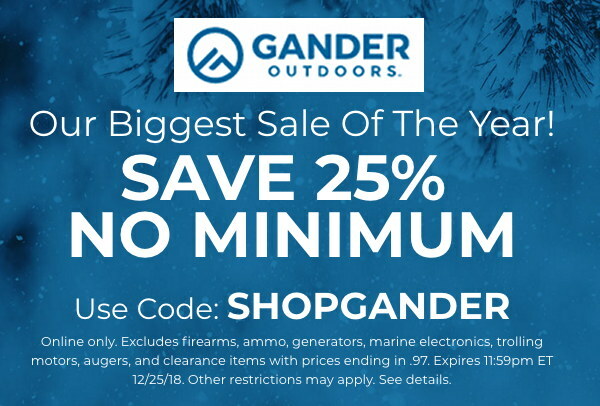 Get 25% OFF purchases at Gander Outdoors, with no minimums. This applies to everything online, except: firearms, ammo, generators, marine electronics, trolling motors, augers, and certain clearance items. But that still leaves scopes, gun cases, hunting accessories, outdoor gear, reloading tools, and countless other items for shooters and outdoorsmen. Don’t dawdle, this 25% OFF Sale ends at 11:59 pm ET on December 25, 2018. 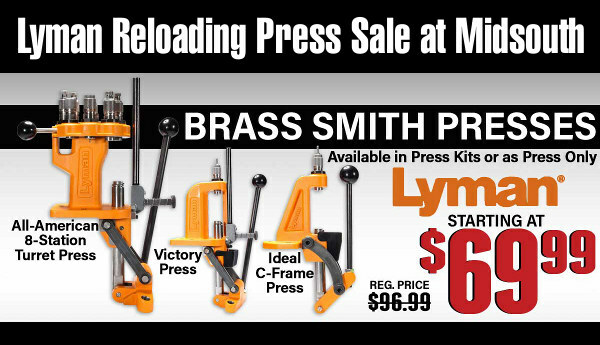 Midsouth Shooters Supply is running a big sale right on Lyman’s impressive new Brass Smith line of reloading presses. There are three models, each offering great performance and value for its class. You can save quite a bit of cash with this Midsouth Lyman Press sale. If you haven’t tried orange yet, we think you’ll be impressed. The little C-Frame is a steal at $69.99. The sturdy O-Frame Singles stage press is $154.99. And if you’re looking for a Turret press, the new 8-station Lyman Turret press ($192.99 on sale) is very impressive — with more stations than the competition, and enhanced strength/rigidity. Good deal on a great chrono. Priced at just $178.99 at Grafs.com, the Magnetospeed Sporter model costs less than half as much as Magnetospeed’s V3 models. This chronograph attaches directly to your barrel so you don’t have to go downrange to position tripods and set up skyscreens. For most people the Sporter Model contains all the features they need. Using Magnetospeed’s XFR adapter (sold separately), data can be transferred easily from the display module to your mobile device. This is also available from Amazon for $183.99 with free shipping. READ Magnetospeed Sporter Review. Nosler’s line of RDF (Reduced Drag Factor) bullets have high BCs for their weight. Precision shooters are reporting outstanding accuracy. Given their high performance and consistency, RDF bullets represent a superior value. 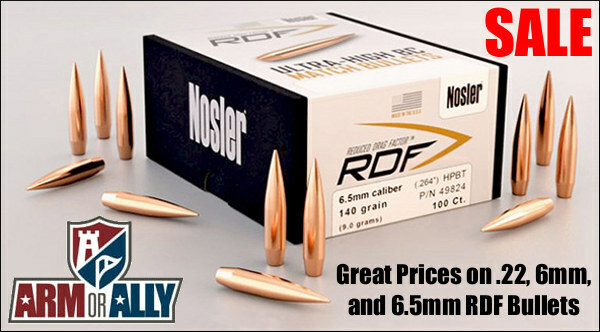 At ARMorAlly you can get Nosler RDFs for under $26 per 100 for popular 6mm sizes. That’s up to $25 less per box than some other premium brands. And the .22-Caliber RDFs are even cheaper. ARMorAlly also has great pricing on Nosler Ballistic Tip, Custom Competition, Accubond, ABLR, and Lead Free bullets. All Nosler Bullets HERE. If your carry gun is too big and bulky, you probably won’t carry it, which sort of defeats the whole purpose. The Ruger LCP is light (9.6 ounces) and compact (5.16″ OAL), so you’re more likely to carry it regularly. The little LCP is small enough to fit in a pocket. The .380 ACP cartridge is not as powerful as a 9x19mm or 40 S&W to be sure, but when your life is on the line, a small gun is certainly better than no gun. 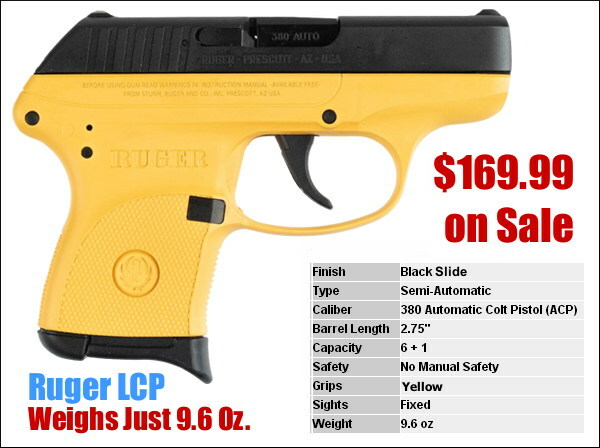 For those looking for a very light-weight, easy-to-conceal handgun, this little Ruger is a solid choice. Owner reviews have been positive and the $169.99 price is as cheap as you’ll ever find for a major manufacturer’s pistol. If you can live with the bright yellow frame, this is a steal. We like these bright, Neon EasyShot 3″ target stickers. They are big enough to see easily at 600 yards, giving you a 1/2 MOA target center at that distance. 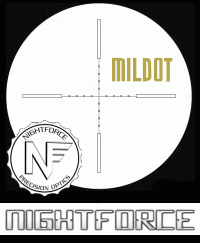 For $12.99 at Amazon.com, you get 250 3″-diameter self-adhesive centers (125 targets per roll) that stick to almost any surface The high-contrast fluorescent red/orange color provides an excellent HI-VIZ aiming point, along with good contrast for bullet holes that fall within the 3″ circle. To help line up your reticle cross-hairs, the target centers feature black markers at 3, 6, 9, and 12 0’Clock. NOTE: These stickers qualify for FREE Shipping. 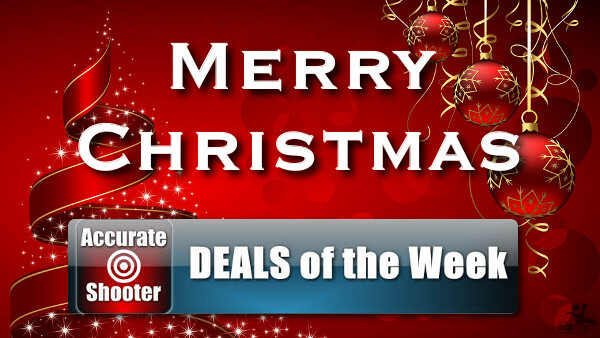 Share the post "Bargain Finder 170: AccurateShooter’s Deals of the Week"
The requirements and prerequisites for each course vary from state to state. Some states require officially-issued identification numbers before starting. Other states require additional “hands-on” instruction. 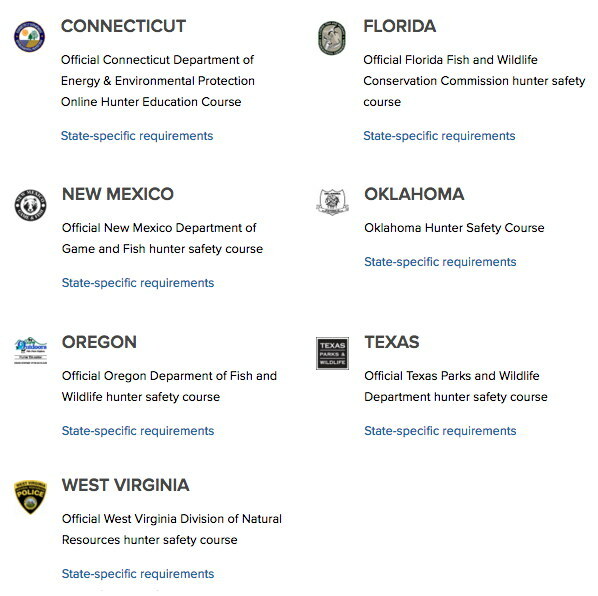 For example, Florida mandates a Skills Day session, Oregon requires a separate Field Day qualification, and West Virginia has a mandatory Hands-on / written portion for hunter certification. For more information, visit the NRA Hunter Safety Education Page. Photo courtesy Horn Fork Guides Ltd. in Colorado. 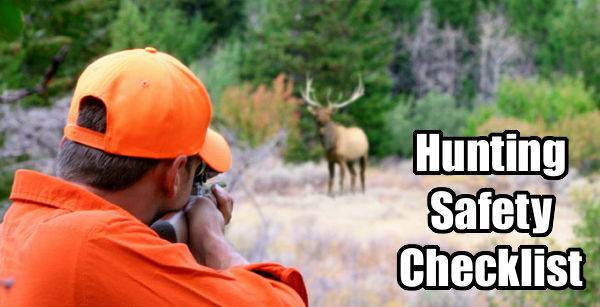 * The NRA plans to add online Hunter Education Courses for more states in the months ahead. 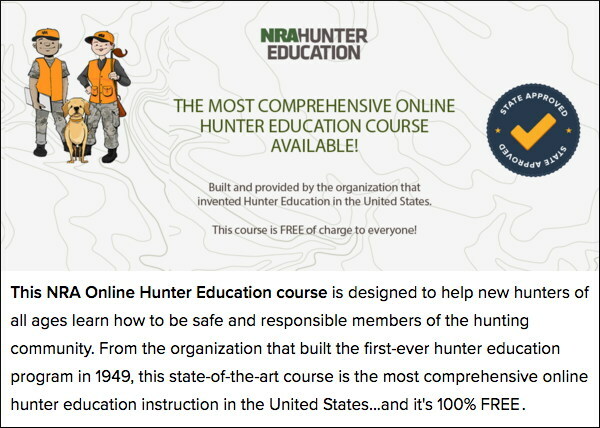 Share the post "FREE State-Approved Online Hunter Education Courses"